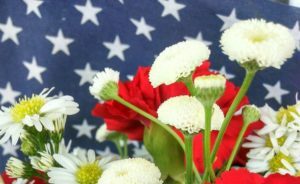 We here at Maine Lakes Wedding and Event Florist have created our share of patriotic themed arrangements. Red, white and blue can be such a fun color scheme to work with, especially in the summer! White is an easy one…roses, dahlias, mums, queen Anne’s lace, baby’s breath. Red can be a harder color to find the right style flower for a summer wedding…Jess loves using bee balm, mini carnations, gerbera daisies, and gypsy dianthus. Blue is the hardest color to find in flowers, but delphimium and hydrangeas are usually a good bet. What ever you do to celebrate our great country’s birthday, make it lovely, too!